It’s that time of year again—the monarch butterfly migration is underway. In the coming weeks, these flight weary beauties will arrive throughout California to settle in before winter. Get excited, this is your best chance to witness one of the greatest natural phenomena in the insect world. It all starts in late summer when a unique generation of monarch butterfly are born that can live up to eight months (as opposed to the typical six weeks). Unlike the previous generations, these young butterflies know innately from birth that it’s time to move south from their northern habitat. So, off they go, flying up to 2,000 miles and as high as 10,000 ft. to complete one of the longest known insect migrations on the planet. How do they know where to go? Well, no one knows for sure. What we do know is that the Rocky Mountains offer the largest handrail for these migrants, bisecting the continent and forcefully directing traffic. Monarchs east of the Rockies work their way down to Mexico, while those in the west head to the central coast of California. 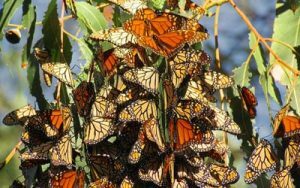 Once they’ve reached their final destinations, monarchs form clusters called “roosts,” typically on large trees out of the wind. There, they enter a state of hibernation and rest until it’s warm enough to begin their reproductive cycles. Roosts, in some parts of the state, can harbor thousands of sleeping butterfly. This monarch overwintering spot takes you back in time to the early 1900s. The farm is fully-functioning, using techniques and crops from the last 100 years. For around $5 (depending on the day and time of year), you can wander around the property and check out the monarchs clustered in the trees. 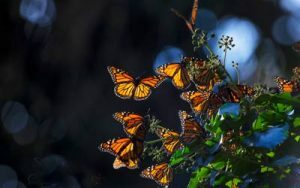 Take a day trip down to “Butterfly Town, USA.” Pacific Grove voted in favor of a special tax to create a butterfly sanctuary and “butterfly molestation” is a fineable offense within the town’s borders. The sanctuary itself is free and there are docents available from 12-3 between November and February to help you find the roosts. The Nectar Garden is the perfect spot to get up close and personal with monarchs. It’s open from 10am to 4pm, Wednesday to Sunday. Be sure to check the calendar for naturalist-led programs before you go. The roosts can get large at this site. The surrounding area’s mild winter climate and large stands of eucalyptus (the monarch’s favorite) make this an ideal spot to overwinter. In 2016, officials reported over 8,000 individuals during the entire season. 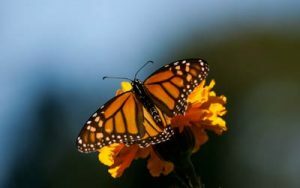 Want to contribute to monarch butterfly conservation? 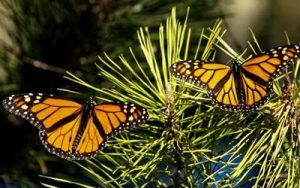 Consider joining the Western Monarch Thanksgiving Count and learn what you can do in your own backyard.